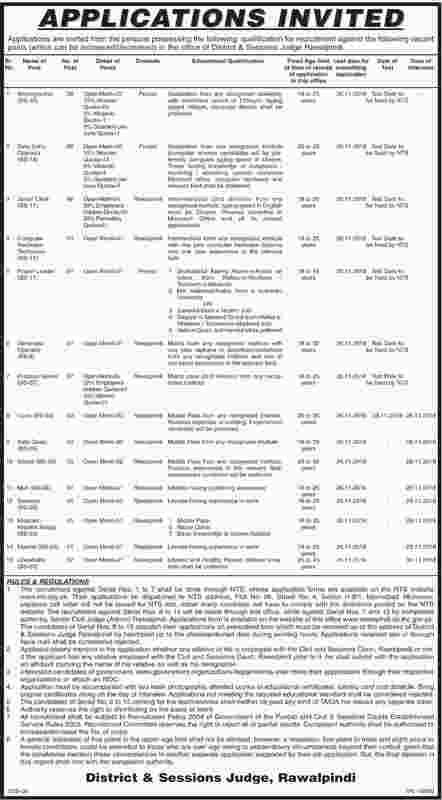 District and Session Court Rawalpindi Jobs via NTS has been announce. Last date to apply is Monday. 26th of November, 2018. Rawalpindi District is a district of Pakistan in the northern region of the Punjab province, 4th largest city of Pakistan. The district has an area of 5,286 km2 (2,041 sq mi). It was part of Rawalpindi Division, until the year 2000 when the division was abolished. It is situated on the southern slopes of the north-western extremities of the Himalayas, including large mountain tracts with rich valleys traversed by mountain rivers. Applications are inviting from the qualified persons for the jobs in Rawalpindi District and Session Court. All those candidates who are eligible for the District & Session Court Rawalpindi Jobs must apply to grab this golden opportunity. Terms & conditions as well as other requirements for Session Court Rawalpindi Jobs are describe below. Last date to apply is Monday, 26th of November, 2018.